After two days in Darwin I flew to the East Kimberley’s Kununurra, arriving in perfect time for the Kimberley Moon Festival and the fabulous line up of artists including Jimmy Barnes, Vanessa Amorosi, the Pigram Brothers & Alex Lloyd; just to name a few. The first 10 rows of our plane seats into Kununurra were filled with high profile someone’s, flying in from around the Country for the event , of which I only recognised one to be Deborah Hutton. We in the rows towards the back of the plane were not poured the same champagne but I did manage a seat next to Barnsey’s stage manager who very kindly offered his business card; of course to call him in case I needed free tickets to the event. Our group of funstars enjoyed the concert from the most perfect position on the hill, which was well defined by striped shirts, eskies and chopper pilots and between here and the mosh pit we managed to ‘do’ the moon as the moon should be done! 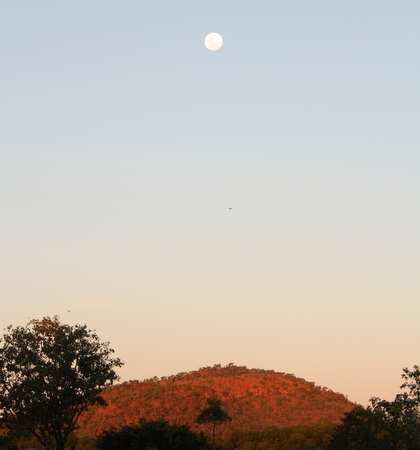 I stayed in Kununurra for a few more days, with my wonderful friends, the Mackies and during my stay, not only did I get to enjoy another stunning Kimberley full moon but I also covered a few stories for the West Australian’s New Homes magazine and the RM Williams Outback magazine during my stay. This Milliner on the move trip is the first that I have co-ordinated my passions of writing and photography with the Millinery and I am really excited with how well the three fall into place together on the road. From Kununurra I made a brief touchdown into Broome to unpack, wash and repack and for a very important catch up with my fellow race horse syndicate girls, in preparation for the upcoming Broome races and most importantly, the first race meet set for May 28th. Broome races will be viewed by Sky channel this year so make sure you keep an eye out for a brightly coloured jockey in teal and pink, because he will be riding our girl! But for now, the Milliner on the move outback adventure continues, as I jump into my car and commence the journey to Yougawalla station, south of Fitzroy Crossing and Halls Creek and into the desert, for some cattle station inspiration for creation.